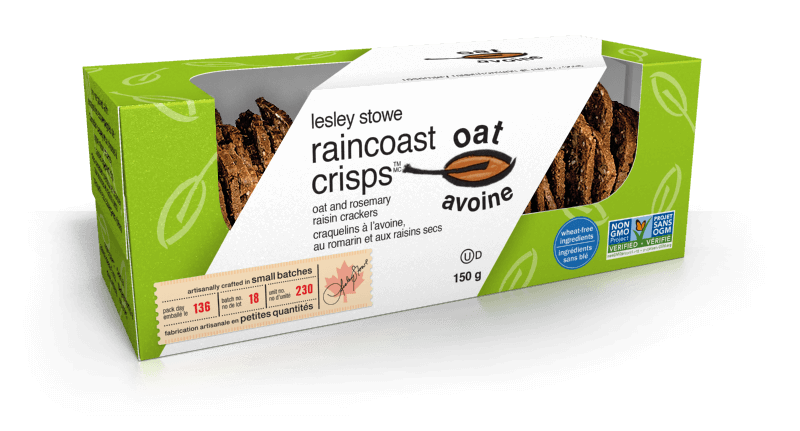 Finally, a crisp made with wheat-free ingredients that truly tastes great! We listened to you, our customers, about developing a crisp that is made with wheat-free ingredients. Meet the raincoast oat crisps™! Our most popular flavour is now made with wheat- and nut-free ingredients for all to enjoy. Perfect with a triple crème brie, prosciutto, or just as they are. Ingredients: Gluten-free oat flour, pumpkin seeds, dried cranberries (cranberries, sugar, sunflower oil), flax seeds, sesame seeds, organic skim milk powder, organic cane sugar, chia seeds, baking soda, sea salt, xanthan gum, golden syrup, honey, citric acid. contains: sesame seeds, milk, and pure oats. may contain tree nuts and traces of wheat. Based on our oh-so-popular version with wheat flour and pecans, this oat crisp is crunchy and chewy at the same time. Pair it with a soft blue cheese, a slice of salami, or hummus for a perfect snack. Ingredients: Gluten-free oat flour, Thompson raisins, pumpkin seeds, flax seeds, sesame seeds, organic skim milk powder, organic cane sugar, chia seeds, baking soda, sea salt, xanthan gum, golden syrup, rosemary, high oleic sunflower oil, honey, citric acid. contains: sesame seeds, milk and pure oats. may contain tree nuts and traces of wheat. With that toasty and nutty flavour you love in the original, these oat crisps are perfect for all of your favourite cheeses & dips, such as an aged cheddar or artichoke tapenade. Ingredients: Gluten-free oat flour, pumpkin seeds, flax seeds, sesame seeds, organic cane sugar, organic skim milk powder, chia seeds, baking soda, sea salt, xanthan gum, golden syrup, honey, citric acid. contains: sesame seeds, milk and pure oats. may contain tree nuts and traces of wheat.